The fan club has been asking me to make a seafood Feijoada, after a trip to Rio De Janiero. So today, I decided to reward them with my own version this dish. Feijoada is Brazil's national dish . It is a comfort food, something that you've gotta have if you ever go down to Brazil. Like most comfort foods, Feijoada's origins are very humble showing a very a strong connection to culinary practices of colonial subjects . Traditional Feijoada recipes include pork trimmings such as feet, tail, ear and snout , and plenty of cooked red beans , ingredients that were usually rejected by slave masters, but put to good use by creative workers. My recipes are much less humble, as I replaced most of the pork ingredients with "frutti di mare" , various types of seafood. You can play with the types of fish here, and can go as far as using cracked crab and lobster, you know the really expensive stuff. I have made two Feijoada variations. A very delicate one that simply aims to express an explosion of seafood flavors. A second variation kicks up the spice meter a bit, strays from its purist form, and includes some spicy slices of chorizo cooked in garlic, ground cumin and coriander, a good dose of Louisiana hot sauce, and Worcestershire. The fan club, liked both , but my Southern Italian taste buds preferred the spice factor by a margin of 2 to 1. 1-2 tablespoons of cayenne pepper. This dish was elaborate and took time to make. Unfortunately can't think of too many shortcuts. You start with cooking dry white beans, but not cooking them all the way . Split them in two batches and finishing cooking them in parallel. The first second batch will be used a base to cook the seafood, and will eventually cream up as the beans cook further. The second batch will be added to the feijoada so that your guests can enjoy scoops intact, whole beans. Take the first batch of beans and add to a high edged pan. Add the vegetables, seasoning except the cilantro which is always added at the last minute. Cook the veggies in the beans until slightly tender. Then start cooking the each of the seafood ingredients until tender, and set aside and keep warm. . Make sure that you do not over cook the shrimp, scallops and the scallops. The claims are cooked last, and need to be removed from the pan immediately after they opened up. The beans should have stared to cream up at this point , and also will have been flavored up with the seafood flavors. In parallel take the second batch of beans and add to a large pot. Add a bit more water (1/2 to 1 cup) . Season. Simmer over very low heat.. We will be adding the seafood flavored beans to this. Once all the seafood is cooked, add to seafood beans to the large pot. Then add the cooked shrimp, scallops ad calamari. Taste and adjust seasoning . Add the cilantro. Then very gently add the cooked chucks of fish - Mahi Mahi and Cod - without breaking. Finally top with the opened claims. Cover the pot with a lid an steam for a few minutes. In separate skillet , toss all the ingredients listed above except the sausage. Cook over low heat a few minutes so that the garlic and spices toast.. Add the sausage and brown a bit. 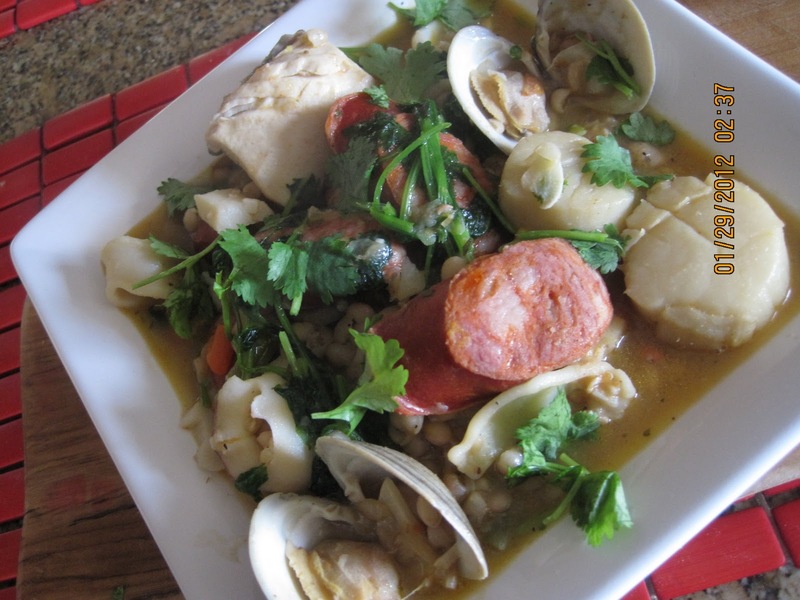 Pour this savory , aromatic mixture to the pot just before adding seafood. Cook 1-2 minutes . Then add the seafood as described above. Serve piping hot . Garnish with fresh cilantro and some EVOO. Down with chilled Prosecco Sparkling Wine and call it weekend .